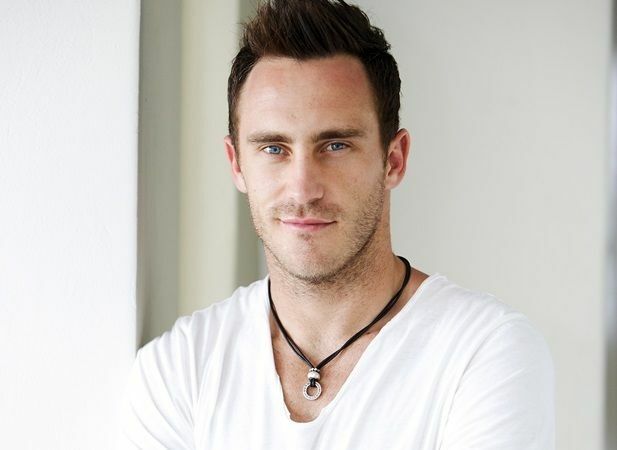 Francois "Faf" du Plessis ( ; born 13 July 1984) is a South African cricketer and the current captain of all formats of the Proteas. He is a usual fixture at international level for the South African national cricket team. A right-handed middle order batsman who moved up to number 3 and also bowls part-time leg spin, du Plessis has played South African domestic cricket for Northerns and the Titans, as well as matches for Lancashire, the Chennai Super Kings, and the Melbourne Renegades. He made his Test debut in November 2012, he became the fourth South African to score a Test century on debut. du Plessis was subsequently also named T20 captain of South Africa for the following Twenty20 series against New Zealand and confirmed full-time skipper in Feb 2013.
du Plessis was given a 6-month contract with Lancashire for the 2008 season starting in April as a Kolpak player after impressing the board with good performances in the local Nottinghamshire leagues for Mansfield Hosiery Mills and in the Lancashire League for Todmorden. Du Plessis started his Lancashire account by scoring 55 against Durham UCCE before being dismissed by opening bowler Foster. Following his six-month stint with Lancashire, du Plessis signed a new three-year deal with the club. 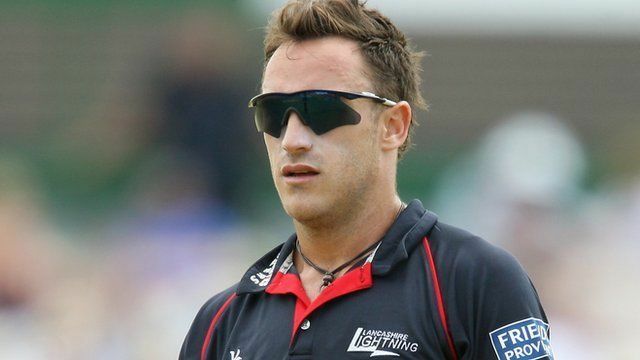 Lancashire coach Mike Watkinson praised du Plessis' fielding, saying "if there's a better fielder in county cricket I've not seen him this season". In March 2010, it was announced that du Plessis would no longer be allowed to play for Lancashire as a Kolpak player after changes to the Kolpak rules. In 2011, he was signed by the 2010 IPL Champions Chennai Super Kings for US$120,000 at the Indian Premier League player auction. Along with Jonathan Vandiar, Dean Elgar, and Ethi Mbhalati, du Plessis was one of four uncapped players to be named in South Africa's 30-man preliminary squad for the 2011 World Cup. He was named one of the five South Africa Cricket Annual's Players Of The Year in 2011. Du Plessis had a very successful season with the Chennai Super Kings scoring 398 runs in IPL 2012. Du Plessis has never got out for a duck in his career, until the qualifier 2 match against KXIP in IPL 2014 having been dismissed for a golden duck. Du Plessis made his ODI debut on January 18, 2011 against India and made unbeaten 60 runs. He was chosen ahead of Albie Morkel for 2011 World Cup in Indian Sub-continent. Du Plessis made his Test debut for South Africa against Australia at Adelaide in 2012 as the number 6 batsman; due to the unfortunate injury and non-availability of JP Duminy. He scored 188 runs in the match and was selected as Man-of-the-match for his resilient performance that ultimately led to the match being drawn and the series being square before the third and final test. He had scored 78 from 159 before being dismissed by Ben Hilfenhaus in the 1st innings, giving a 93-run 8th wicket partnership with injured Jacques Kallis (58 from 93). Du Plessis subsequently was the last man to be dismissed, taking the South African score to 388 in reply to Australia's 550. In the 2nd innings, he scored a resilient match-saving 110* from 376 balls, a marathon knock which spanned 466 minutes to save the defeat. He was part of a 99-run 6th wicket partnership with an injured Jacques Kallis, ensuring that South Africa earned a draw on the 5th day. In the next test at WACA Ground, he scored a resilient unbeaten 78 from 142 balls to take his team's score to 225 in the 1st innings, from 75/6 with able support from Robin Peterson (31 off 45), Vernon Philander (30 from 54) and last man Morne Morkel (17 from 15). South Africa won the 3-match Test Series against Australia 1–0. In December 2012, he was named captain of the South African T20 team for three matches against New Zealand. In October 2013, he was fined 50% of his match fee after being found guilty of ball tampering in a Test match against Pakistan. In December 2013, he scored a test match saving hundred with a score of 134 off 309 balls against India while chasing 458 to win in the 4th innings. The match ended in a draw with South Africa on 450/7, only 8 runs short from what would have been the highest successful run chase in test match history. Du Plessis made his maiden ODI hundred on 27 August 2014 against Australia after scoring 106 off 98 balls while chasing 327 runs to win. His partnership of 206 runs with AB de Villiers for the 3rd wicket is the highest for South Africa against Australia. 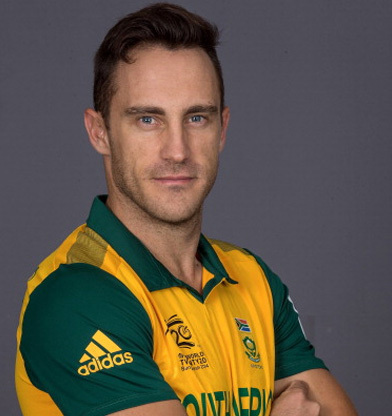 On 6 September 2014 against Australia, Du Plessis fell only 4 runs short of becoming the first batsman in history to score 4 ODI hundreds in a row. (This would also have been a record for the most ODI hundreds by a batsman in any ICC ODI tournament) He initially looked on course to achieve his 4th ODI hundred until his batting partner AB de Villiers hit 2 sixes and a four in quick succession, which meant Du Plessis had to obtain all the remaining runs in the game single-handedly if he was to reach this milestone. Needing only 1 run to win the game with plenty of wickets and balls in hand, Du Plessis was on 96 and therefore had to hit a boundary (barring any extras) in order to reach 4 ODI hundreds in a row, but while attempting to hit a boundary he was caught off the bowling of Australia's spear-head Mitchell Johnson. South Africa still went on to win the ODI match against Australia comfortably by 6 wickets. This victory also secured South Africa as the winners of the ODI tri-series, and Du Plessis subsequently became Man of the Series. 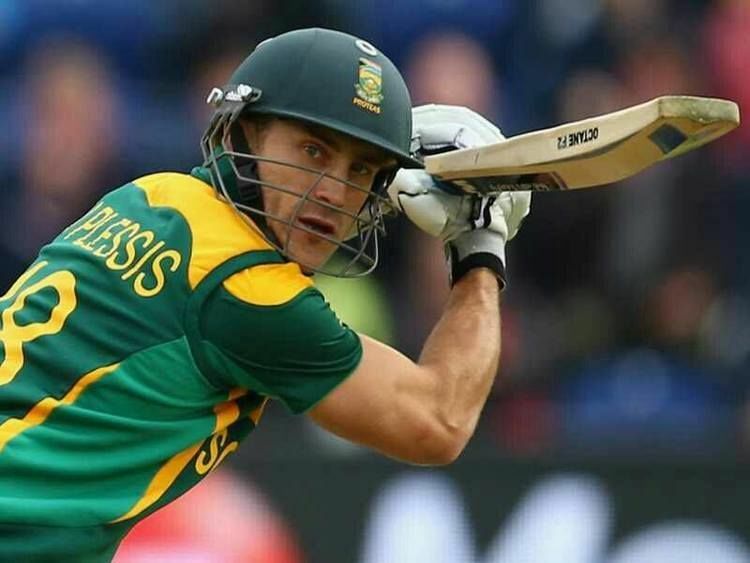 On 17 December 2014, Du Plessis set the record for playing the most number of international cricket innings before scoring a duck (108) and also became the only batsman to play in over 100 international innings before first ever duck. On 27 December 2014, Du Plessis scored his second first innings century at the same ground: St. George's Oval. On 11 January 2015 Plessis scored 119 in 56 balls against West Indies, becoming the second South African (after Richard Levi) to score a century and also the first South African to score centuries in all forms of the game. For the 2016–17 Australian tour of South Africa to play five ODIs, du Plessis was named captain after original skipper AB de Villiers ruled out due to a surgery. On 2 October, du Plessis scored his sixth century in second game. In the process, he became the second cricketer to score centuries in all formats as captain, after the Sri Lankan, Tillakaratne Dilshan. During that same match at Johannesburg, Faf Du Plessis set a rare record for becoming the first batsman in cricket history to score centuries in all three formats of cricket at a single venue at Johannesburg. Du Plessis also set the world record for becoming the first player in history to score a century in an innings of a Day Night test match as captain. In that same test match of that innings Du Plessis set the record for declaration of the lowest ever total ever as an unbeaten captain,where he remained unbeaten on 118 in South Africa's first innings score of 259/9 dec.
On 12 December 2016, with AB de Villiers stepping down as Test Captain, du Plessis also inherited the role. On 7 February 2017, du Plessis scored 185 runs in the fourth ODI against Sri Lanka, becoming second highest invidial score by a South African, just three short for 188* by Gary Kirsten. 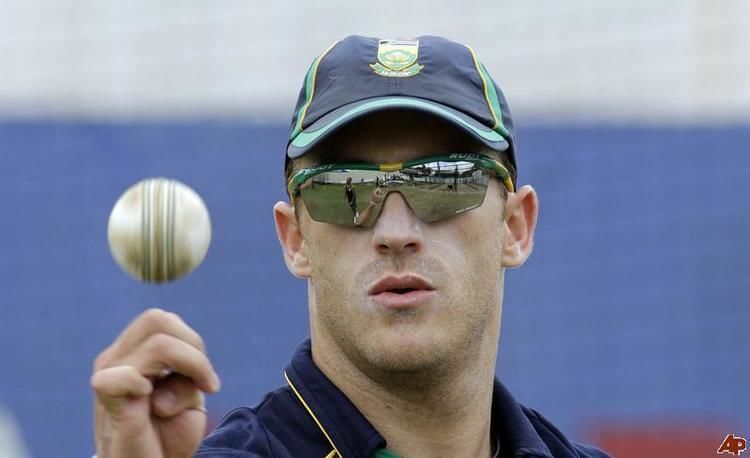 du Plessis has been accused of ball tampering twice during his international career; once during a Test match against Pakistan in 2013 after which he was fined 50% of his match fee, and, in 2016, during another Test match against Australia. The first incident against Pakistan involved du Plessis seemingly rubbing the ball against a zip on his trousers in order to change the nature of the ball. This was caught on video and du Plessis was subsequently found guilty. 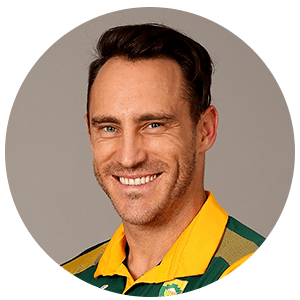 The second incident against Australia involved du Plessis apparently rubbing a "lolly" against the ball, again to change the nature of the ball. 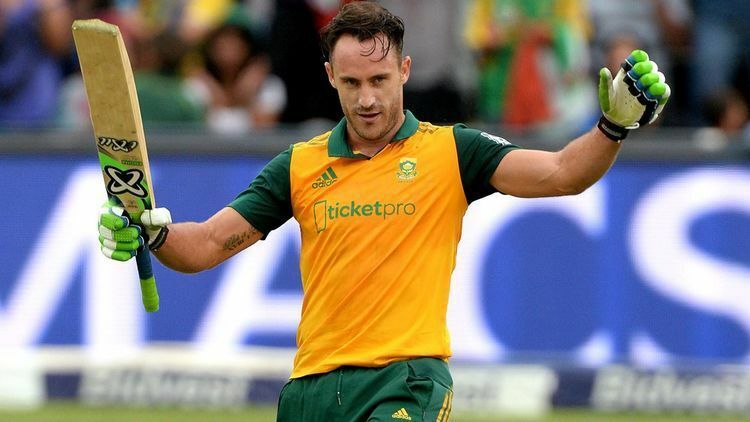 Du Plessis has denied any wrongdoing and has pleaded not guilty to the charge. Hashim Amla, one of du Plessis' teammates, defended him in a speech he gave to Australian media about the incident stating that the tampering claims were "a joke" and called them "ridiculous". du Plessis was found guilty of ball tampering on 21 November 2016. He was subsequently fined 100% of his match fee for the second Test against Australia and was given three demerit points.Apart from being fined with 100% with his match fee,in the third and the final test(which was a day night test match) against Australia,he managed to score a century. On 24 August 2017, ODI captain De Villiers stepped down from captaincy and Du Plessis named as the captain in all three formats. On the same day, he was named as the captain of World XI team for the three T20Is in Lahore, Pakistan. 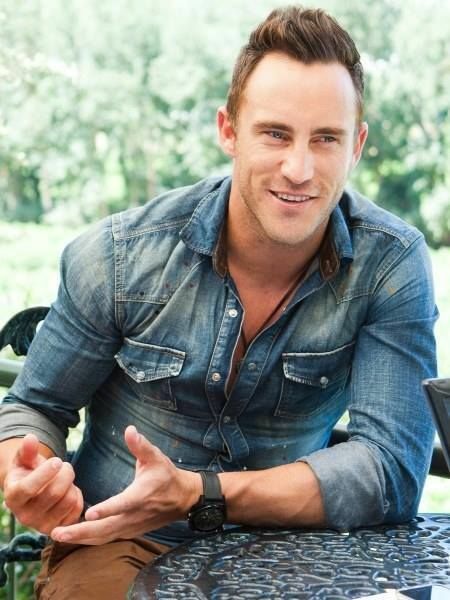 Du Plessis attended Afrikaanse Hoër Seunskool (Afrikaans High School for Boys, also known as Affies), a public school located in Pretoria. He attended alongside fellow Titans cricketers AB de Villiers, Heino Kuhn and Jacques Rudolph. He is also a graduate of the University of Pretoria. Du Plessis is a second cousin of Namibian rugby player Marcel du Plessis. His father Francois Du Plessis played rugby in the Centre position for Northern Transvaal in the 1980s. He was featured in the music video for the song "Maak Jou Drome Waar", a duet by AB de Villiers and Ampie du Preez.